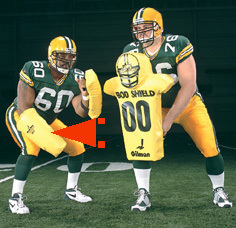 The FLIPBACK is a forearm shield. Protects area from elbow to knuckles. Allows full range of motion without tying up your hands. Wear it in scrimmage or “thud” practice drills. Ideal for martial arts training. Two elastic web handles stretch to fit any size arm. Measures 3" thick by 9" wide by 18" long. Sold in pairs. "The coaching point is to attack a defender's arms with a violent slap or chop!"